Entering its fourth generation, the all-new Audi A8 ushers in a new era of design which emphasizes progressive elegance. As the flagship luxury sedan for the brand, the A8 harmonizes cutting-edge technology with bespoke craftsmanship. Every element of the new A8 has been engineered for superior refinement and advanced efficiency. The body composition is based on the ASF® multi-material frame technology, using 58 percent aluminum parts paired with hot form-steel and ultra-high strength carbon fiber reinforced polymer components. The end result is improved body rigidity, precision handling, and a serene interior environment for all occupants. Inspired performance, sophisticated technology, and luxurious comfort combine to make the flagship Audi A8 a leader in the full size luxury sedan segment. Up front, the all-new 2019 A8 sports a wide, upright Singleframe® grille which joins with a flowing and muscular body design to help radiate the commanding presence of the vehicle. These dynamic proportions help accentuate the front and rear wheel arches, helping to hint at the advanced capability found in the standard quattro® all-wheel drive system. Exterior lighting is state-of-the-art, with HD Matrix LED headlights and rear lamps with OLED technology announcing your arrival in a dynamic fashion. Specialized lightweight materials used in the construction of the A8 help translate even the roughest road surfaces into a calm, tranquil ride. 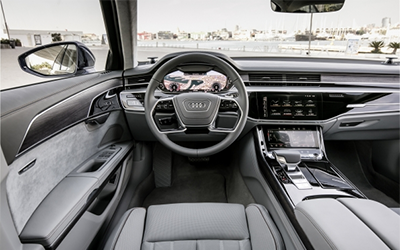 Refined, simplified, and intelligently reimagined -- the cabin of the all-new 2019 Audi A8 offers unrivaled comfort and luxury. Contour and ambient lighting helps accentuate the fine details and premium materials found throughout. Offering an escape from the hectic outside world, rear-seat passengers in the 2019 A8 have access to several comfort features. The Rear Seat Entertainment system consists of two Audi tablets and a detachable Rear Seat Remote. A smartphone-sized OLED touch control remote allows passengers to seamlessly customize their seating and infotainment preferences. For the ultimate in relaxation, the right rear passenger seat offers an available heated massaging footrest discreetly positioned on the rear of the front passenger seat. The new MMI touch response® system transforms the previous generation's rotary/push-button control and touchpad into a 10.1-inch touchscreen display that, when turned off, blends almost invisibly into the high-gloss black surround. 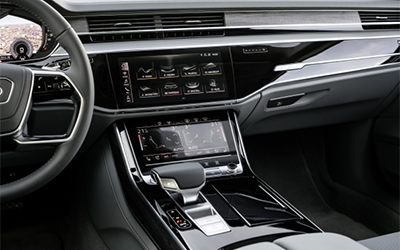 Audi connect services have also been diversified, including the all-new HERE-powered map and navigation system. Making its debut in the A8, the system has the intuitive ability to learn over time through driven routes and provide smarter route suggestions. The new myAudi app becomes a personal mobility manager, where a route started on a smartphone can seamlessly continue on the on-board system when you step behind the wheel of the A8. Hear your music exactly like it unfolds in a concert hall with the Bang & Olufsen premium audio system featuring 3D surround sound. Designed to blend smooth power delivery with efficiency, the 2019 Audi A8 features a new 3.0-liter V6 turbo engine paired with a standard 48-volt electric mild-hybrid drivetrain. Engineered to support the TFSI engine, the 10Ah lithium-ion battery and new belt-driven alternator starter (BAS) allow for recuperation of power and is designed to provide an efficient, responsive, and smooth ride. Standard quattro® all-wheel drive with a self-locking center differential gives you complete command across all weather conditions. With active electromechanical suspension, dynamic all-wheel steering, and the powerful all-new electronic chassis platform -- every aspect of the all-new A8 chassis and ride experience are exceptional. 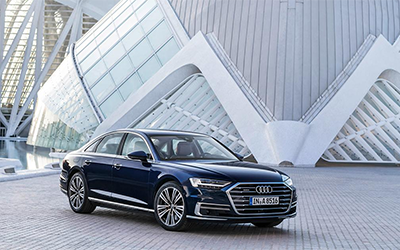 The 2019 Audi A8 sets a new standard in luxury with 40 unique driver assistance and convenience functions. Setting a new technological benchmark, the A8 includes advanced collision mitigation and cross traffic assist, stress reducing adaptive cruise assist, along with an advanced intersection assist. Offering an intelligent approach to parking assistance, Audi AI park pilot and the Audi AI garage pilot systems can take control while the driver can monitor the action. Making history for 2019, the A8 is the first production automobile developed specially for Level 3 automated driving. 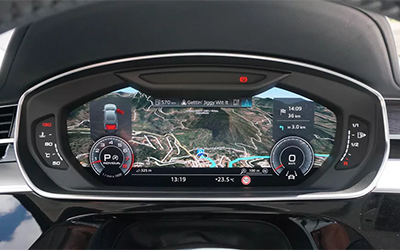 When equipped with Audi AI traffic jam pilot, the feature takes charge of driving in slow-moving traffic at up to 37 mph on freeways and highways where a physical barrier separates the directional traffic. Audi continues to assess timing and will deliver the system when market readiness allows. Expected to arrive at dealers in late 2018, the Audi A8 sets the benchmark for modern luxury. 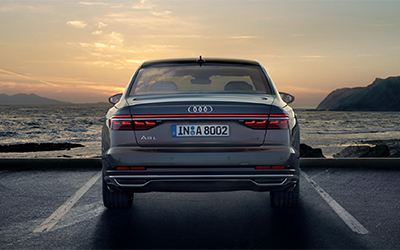 Stay informed on the latest news and updates for the all-new 2019 Audi A8 with Audi Louisville.